background: I'm an amateur and self-learner pianist. What I know, I know from books or google, so I'll start with summarising what I already know - please don't hesitate to correct me if I have something wrong here. I know that in western music there are different "modes" (= kinds of diatonic scales?). All that modes have a lot in common: they build the whole octave from intervals of 5 full tones and 2 semitones in some order. Various permutations of those intervals yield different modes, and the only constraint is that the two semitones must have 2 or 3 full tones between them. Different such permutations (= different modes, = different kinds diatonic scales, synonymous?) have different Greek names: T-s-T-T-T-s-T = Dorian mode, T-T-s-T-T-s-T = Myxolydian mode, etc, etc. Cool. Aeolian mode, T-s-T-T-s-T-T, is also called "Minor diatonic scale". Almost all songs I encouter are written around either of the above scales (in an arbitrary key). Why those two (and only those two, I suppose) got their own "mainstream" names and are used much more commonly than the remaining possibilities, and the rest are somehow "in the shadows"? I'm used to names such as "Toccata and Fugue in D minor", but I've never heard anyone entitling a piece "Waltz in C Dorian", for instance. 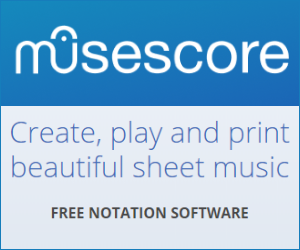 Do composers avoid those scales or something? Doesn't the variety allow for more expresiveness? Is there any practical or historical reason for that phenomenon? First some background if you weren't already aware: in any tonal key, say, C major, the first note of the scale, i.e. the root, is called tonic, the fifth is called the dominant, and the 7th is called the leading tone. A major triad sounds the way it does because it fits into those first notes of the harmonic series. The flat 7th (in C major, Bb) actually used to be the norm, if we go back quite a ways in early music. The German musical system even today uses B to refer to what we call Bb, and H to refer to what we call B natural. In common practice, the dominant 7th is a chord that resolves to a tonic chord because chord tones only have to move by a half step . Think G-B-F (G dominant 7th) resolving to C,-C-E (C Major). These half steps are important: the B natural in C major is just a half step below the tonic, and we call it the leading tone. Another part of the answer has to do with how major and minor are generally defined by triads, not by entire scales. If you take a major scale and start planing triads up and down diatonically, you're going to get mostly major and minor chords, plus one diminished triad based on the leading tone. The fact that lots of music was written in just one key meant that major and minor were the primary chords available for use since you could make them both with the notes present in the major scale. Also, traditional minor breaks a lot of the rules of diatonic modality to fit with common practice. The flat 3rd stays the same, but if you look at a melodic minor scale, the natural 6ths and 7ths are used in addition to the flatted ones. The Ionian mode IS the most stable mode. NReilingh explains why in his answer. However, the fact remains that MUCH of music is actually written in modes without appearing that way. The Ionian mode is usually the basis for the key signature of the song's music. For example, the "key" of C has no sharps and no flats because playing from C to C with no sharps/flats would produce an Ionian scale. The tonic changes: Say you start out in the key of C. Somewhere in the middle of the piece, the tonal center, the "tonic note" changes (subtly) to F, for a short time. For that short passage, you could say that the piece temporarily shifts to F Lydian. The only way to identify this is with listening and analysis, and even then, its open to interpretation whether or not you want to say the piece "shifts"
A consistent accidental appears: Starting in the key of C again. For a short time in the passage, be it a few measures or a few lines, you might have a recurring accidental. In C, an F# might appear. If you rule out that it is not a modulation or leading to a modulation (i.e. C remains the tonic), then you are effectively in C lydian. Again, you have to determine by listening and analysis what note remains the tonic note? It's not always the name of the key signature. The point of the above (I hope it was coherent), is to say that the "other" modes are not used "officially." Ionian (and slightly lesser so, Aeolian) retain a special status for good reason, most pieces start and end up there, so it makes sense to name the write the key after the Ionian scale of the tonic. I personally use scales more like a concept of theoretically explaining and understanding music after it was written. The composers/artists write music that sound good and by coincidence you find out that certain structures in a piece have certain effects and are therefore repeated in many other pieces. For a non-experienced listener, music that uses uncommon scales is usually more difficult to hear/understand/appreciate than music with plain major or minor scales, that's just what he's used to. In jazz music for example, all kinds of different scales are used (see Wikipedia article on modal jazz for example), but the music is difficult to appreciate for many people. A lot of jazz and blues is based around variants of major and minor, the Mixolydian and Dorian modes respectively. But there remains the same dichotomy. Mixolydian is just like Major but with a flatted seventh scale degree, called the dominant-seventh. Dorian is just like Minor but with a sharp sixth scale degree. Why isn't D the “most central” note?